Despite the fact that one of our kids is not a potato fan at all, I love to serve various potato side dishes with our meals. There are so many different options when it comes to potato sides and I always feel like I can find a good fit for any meal. Personally, I’m a huge red skinned smashed potato fan. I could literally make a meal out of those! In fact, there have been times when I’ve boiled up a potato or two and mashed it with a little butter, sour cream, milk and garlic powder to have for a quick lunch. It’s just SO good! The only issue I have with potatoes is that they’re not always the easiest to freeze. Their consistency and quality can really decrease sometimes. The only potato dish that I’ve had any success with freezing has been mashed potatoes. Until now that is. 1. Place the potatoes in a large pot filled with cold water. Bring to a boil and boil until potatoes are fork tender, about 15 minutes. Drain and return potatoes to the pot. Let sit for 2-3 minutes, just to absorb any liquid still left on the potatoes. 2. Add the butter or margarine to the pot and mash with the potatoes. Transfer the mashed potatoes to a large mixing bowl. 3. 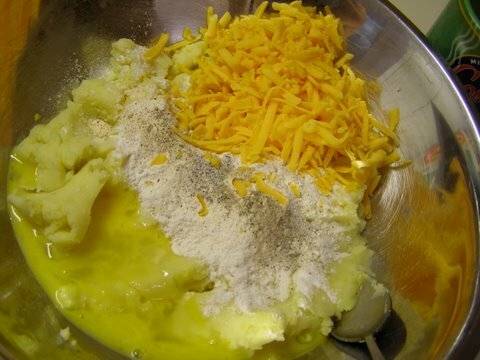 Add the cheese, flour, egg and seasonings to the mixing bowl. Stir to combine well. 4. Using 1-2 tablespoons of potato mixture at a time, roll into a ball. Roll the balls into the breadcrumbs until covered completely and place on a baking sheet. Repeat until done. 5. Drizzle the potato bites with some melted butter or spritz with baking spray. Bake at 350 degrees for about 15 minutes, until golden brown and lightly crunchy. This recipe should make about 3 dozen potato bites, depending on the size. To freeze the potato bites, flash freeze on a large dish or baking sheet until firm, then transfer to a plastic freezer bag. This post is being linked to Tasty Tuesday at Balancing Beauty and Bedlam. Nice twist, and I love that they freeze well. I’m going to make an extra batch for my freezer. Thanks! I’ll have to add this to my monthly menu plan for this month. I love the fact you can freeze them as well. This will be great for my toddler. Wow–these look awesome. I *love* potatoes, but I try to avoid unnecessary carbs, replacing them with a non-carby veggie. I think I’m going to have to try these, though. try mixing some cauliflower in with the potato. You will never notice as long as you stay well below a 50% ratio. Those look like they might just MELT in my MOUTH! Mmmmmmm! Thanks. Looks Yummo! These do sound so good – and how wonderful they freeze! I imagine they could be a great way to use up left over mashed potato too. Question about freezing – do you freeze them after you bake them, or before? And, when using them from the freezer, do you thaw them first or cook them from frozen? I was wondering the same thing about freezing? Do you bake first and then freeze? and do you cook from frozen or thawed? 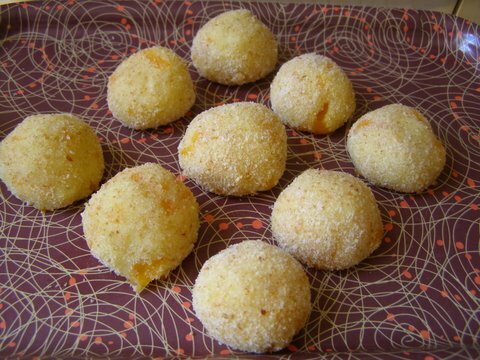 my mom used to make theses when i was kid,we used to call them potatoes balls,but instead of shredded cheese she put a chunk of cheese in the center,and instead of baked she fried her’s. I know this is an old posting, but did anybody get an answer on whether these potato bites are baked before frozen? Do you bake from a frozen state? hello!,I really like your writing very much! percentage we be in contact more about your post on AOL? around their family room floor. Rhinestone Wear is a industry Leader in Rhinestone Shirts and Rhinestone Clothing.